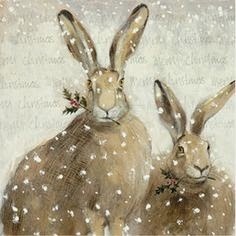 I have done a design with hares before called 'button moon gazing' but this design is new and more whimsical. The hare in question will have a tweed jacket on and a pocket watch! I would like one of these for our home as well. The only problem now is do I stitch the Hare or the Mermaid first!!.... I need eight pairs of arms and hands, but getting clothes might be a problem!!! Next week I will be starting in earnest and I will be letting you know how I am getting on and what I will be stitching. Plus I will be letting you know of Vintage Christmas fairs that are up and coming as well as the stitch of the week. Until then have a wonderful day and Happy Stitching! I love hares too !